Metal cluster in enzyme that breaks down carbon dioxide can switch between two different shapes. Many microbes have an enzyme that can convert carbon dioxide to carbon monoxide. This reaction is critical for building carbon compounds and generating energy, particularly for bacteria that live in oxygen-free environments. This enzyme is also of great interest to researchers who want to find new ways to remove greenhouse gases from the atmosphere and turn them into useful carbon-containing compounds. Current industrial methods for transforming carbon dioxide are very energy-intensive. 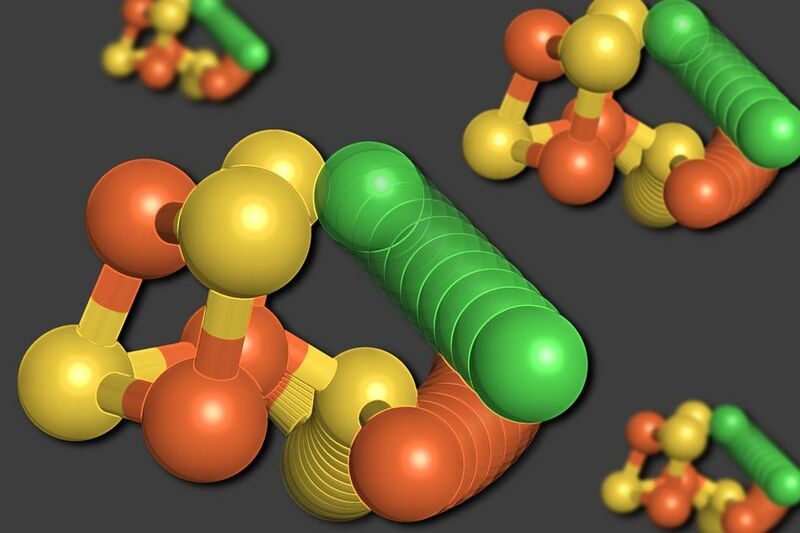 Drennan and her colleagues at MIT, Brandeis University, and Aix-Marseille University in France have now discovered a unique aspect of the structure of the “C-cluster” — the collection of metal and sulfur atoms that forms the heart of the enzyme carbon monoxide dehydrogenase (CODH). Instead of forming a rigid scaffold, as had been expected, the cluster can actually change its configuration. “It was not what we expected to see,” says Elizabeth Wittenborn, a recent MIT PhD recipient and the lead author of the study, which appears in the Oct. 2 issue of the journal eLife. Metal-containing clusters such as the C-cluster perform many other critical reactions in microbes, including splitting nitrogen gas, that are difficult to replicate industrially. Drennan began studying the structure of carbon monoxide dehydrogenase and the C-cluster about 20 years ago, soon after she started her lab at MIT. She and another research group each came up with a structure for the enzyme using X-ray crystallography, but the structures weren’t quite the same. The differences were eventually resolved and the structure of CODH was thought to be well-established. Wittenborn took up the project a few years ago, in hopes of nailing down why the enzyme is so sensitive to inactivation by oxygen and determining how the C-cluster gets put together. To the researchers’ surprise, their analysis revealed two distinct structures for the C-cluster. The first was an arrangement they had expected to see — a cube consisting of four sulfur atoms, three iron atoms, and a nickel atom, with a fourth iron atom connected to the cube. The researchers believe that this movement, which occurs upon oxygen exposure, helps to protect the cluster from completely and irreversibly falling apart in response to oxygen. “It seems like this is a safety net, allowing the metals to get moved to locations where they’re more secure on the protein,” Drennan says. This is the largest metal shift that has ever been seen in any enzyme cluster, but smaller-scale rearrangements have been seen in some others, including a metal cluster found in the enzyme nitrogenase, which converts nitrogen gas to ammonia. “In the past, people thought of these clusters as really being these rigid scaffolds, but just within the last few years there’s more and more evidence coming up that they’re not really rigid,” Drennan says. The researchers are now trying to figure out how cells assemble these clusters. Learning more about how these clusters work, how they are assembled, and how they are affected by oxygen could help scientists who are trying to copy their action for industrial use, Drennan says. There is a great deal of interest in coming up with ways to combat greenhouse gas accumulation by, for example, converting carbon dioxide to carbon monoxide and then to acetate, which can be used as a building block for many kinds of useful carbon-containing compounds. “It’s more complicated than people thought. If we understand it, then we have a much better chance of really mimicking the biological system,” Drennan says. The research was funded by the National Institutes of Health and the French National Research Agency.